Testing of the transformer oil. What are we looking for? GlobeCore / Testing of the transformer oil. What are we looking for? Dielectric strength and accompanying tests, which include breakthrough voltage test, moisture content test and visual estimation of contamination. A brief analysis, including determination of acidity, water soluble acids, flashpoint and color. Full analysis: this includes all of the brief analysis procedures, along with dissipation factor test, sodium sample test, oxidation stability and quantitive analysis of moisture, gas and solid particle content. The chemical composition of transformer oil depends on raw material and refining methods. Composition of used oil also depends on regeneration and reclamation process by adsorption and addition of various stabilizing additives. Oil chemistry determines its properties. Electromagnetic field, humidity and temperature cause the original carbon compounds to decay. The oil also dissolves parts of solid insulation and construction materials of the transformer. Such processes case chemical changes in the oil and degrade its performance, posing danger of transformer failure and downtime. Various chemical and physical tests are performed to determine possible equipment problems. The main properties of transformer oil are tested; of which much attention is paid to the most important function of the oil, its dielectric strength. This parameter is influenced by presence of solids and other contaminants in the oil. Contaminants increase breakthrough potential and increase the dissipation factor of the oil. Practically any problem inside the transformer will lead to decreased dielectric strength of the oil. This parameter, along with the dissipation factor, is measured in electrical laboratory. Contact of oil with air, presence of solid particles, decreased dielectric strength promotes a new wave of oxidation processes and formation of sludge from soluble and insoluble materials. Contaminants degrade both liquid and solid cellulose insulation. The sludge also degrades cooling of the transformer by clogging the cooling channels. Solid particle content is measured by qualitative and quantitative methods. Quantitative method involves passing of oil through a clean weighted paper filter. The filter is then dried and weighted again, and the weight difference indicates the amount of solids in the oil. Qualitative method involves heating of oil to 130C. Water presence is confirmed if cracking noise is heard at least twice when the oil starts foaming. Presence of water soluble acids in the oil, which are quite aggressive chemically, causes metal corrosion and degradation of solid insulation. Determining of water soluble acid content is based on their extraction from oil by water or alcohol solution. Alkali and soaps are detected by a 1% phenol-phthalein solution, which changes color in presence of contaminats. 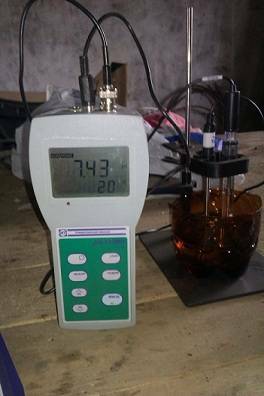 If water soluble acids are detected, the oil should be regenerated. Possible problems inside the transformer are indicated by testing the oil’s flashpoint. If the temperature, at which the oil’s vapors ignite in a closed cup, form a mixture with air which ignites when exposed to flame, decreases by more than 5 degrees, a full transformer inspection is required to determine the problem. To identify and resolve transformer oil quality problems, analysis of the above parameters may not be sufficient. Other test, not mentioned in this article, may also be needed in some cases. Timely identification of problems is essential for reliable operation of electric equipment.